Last week on Monday and Tuesday I spent some quality time on the phone with members of The Afronauts helping us get through our current hump. We had a pretty good rehearsal Tuesday night. Wednesday night Andrea and I did a road bike ride north up 75th St, east on Lookout Rd past Lafayette and out into Erie. It was 31 miles round trip and took us around 3 hours. It was a new high score in daily road miles for both of us. She's doing a week-long road race across the state of Iowa next week, so this was some good training for that. 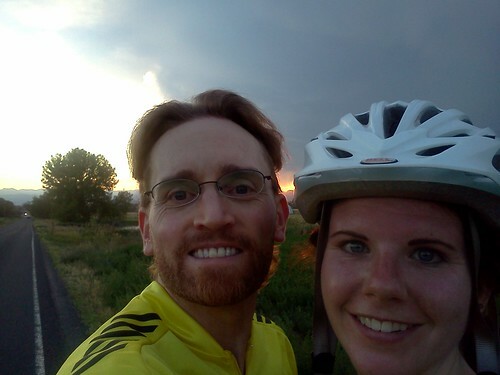 We had beautiful views all up and down the front range with the sun just dipping behind the mountains. Thursday I worked late doing a software release, and had to forego my usual CATS fabric workout for packing for my weekend trip. 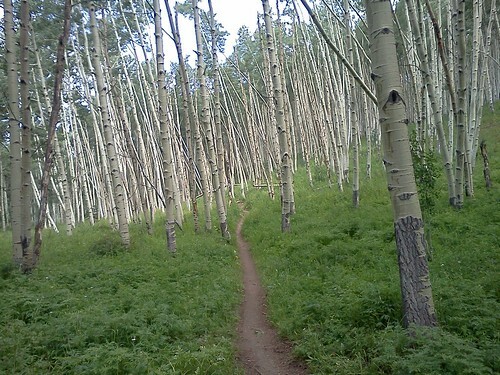 Friday I left work early to head out to Crested Butte for a CHAOS mountain biking trip. I picked up Brenda who also lives here in Louisville and we waited at the Whole Foods Parking Lot for our ride, Mike, to finish his shift at work. I parked my car around the corner at Big Wave Lew's house. When Mike showed up, we zoomed off toward Crested Butte. It's about a 5-hour drive, so we arrived just before 10 PM. Finding the Hostel took a few misses as it wasn't on the street we thought and it had no lighted sign. But we eventually found it and happened to bump into the lady running it to get checked it, which otherwise would have been a pain since they seem to leave it unstaffed after hours. It's pretty sweet in my opinion. Fancy living room, kitchen, and bathrooms plus bunk beds for $32 per night. Saturday morning we got a slow start, as is often the case with group trips. Mike and I got some delicious breakfast sandwiches from the cafe next door. The group carpooled up and rode the Snograss trail first. There was a heavy dose of climbing right at the beginning and that put the fear into some of the group, but we carried on and were rewarded with dense groves of old-growth Aspen. I went ahead with just Brad and Charles. We connected Snograss to Slate road, the new Lupine Trail, and finally down to Upper/Lower back into town. It was a really fantastic ride. The trails are great. We rolled straight into town and came across the rest of our group just ordering lunch at Maxwell's, having completed a shorted out-and-back ride on Snodgrass. We joined them and I enjoyed a tasty buffalo burger (second one I've ever had I think). I went back to the hostel and took a long nap as the afternoon rains set in. I didn't want to lie around all afternoon, though, so I walked through town a ways in the drizzling rain and eventually discovered a small BMX bike park at the end of the street where the hostel is. I rode that for a bit alongside a set of four siblings, two boys and two girls. The boys had used duct tape to secure plastic shopping bags around their shoes, and conversed occasionally about it not being muddy enough to really need it. I gathered this was a rule imposed by their mother. I biked a little ways up the bike path between Crested Butte and the Mt Crested Butte resort town, but then headed back to the Hostel to clean up for dinner. We at at Donata's mexican restaurant in town and enjoyed lively conersation. My favorite was the special soup of the day which was pumpkin with toasted pine nuts, cinnamon, sour cream, and just enough spices. The rain continued to fall, occasionally increasing to storm levels for brief periods. I stopped at Thrid Bowl for homemade ice cream while walking back to the hostel in the rain. Sunday Mike woke me up at 6:30 AM so we could capitalize on the better chances of clear skies early in the morning and ride the very famous Trail 401. We drove up to Mt Crested Butte, stopped to pick up Rhonda, and then continued up the narrow and treacherous 4WD dirt road to the top trailhead of trail 401, elevation 10.700 ft. Rhonda dropped us off, drove down to the exit point, left the car for us, then took her bike back down to her condo. The first two miles or so of Trail 401 are all steep climbing. It's pretty exciting to be at 11,000 ft at 8:15 AM cranking your legs like the dickens and feeling your heart pounding in your chest. Mike works very long overtime hours at his job and was really not liking the long climbs, but we made it to the peak point and it's mostly downhill from there. So Trail 401 definitely earns its reputation. The views are absolutely stunning. 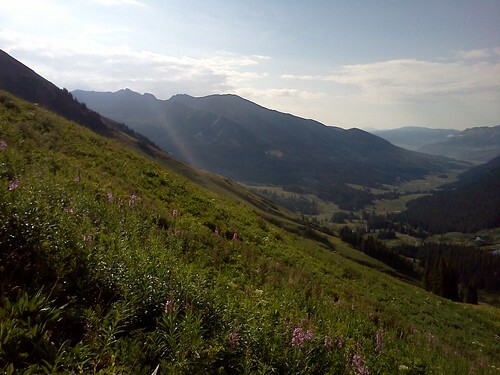 You are riding narrow single track with lush green grasses and flowers brushing dew onto your shins while looking down across gorgeous mountain views. It was a great ride. We only ran into one other couple riding it that early. It had great variety: smooth dirt, small sections of mildly technical rocks, tree roots, puddles, bridges, narrow ledges, and challenging uphills. It took us about 2.5 hours to do it, including numerous stops for photos and videos. After the ride we cleaned up in the hostel and then ate a well-deserved lunch at Brick Oven Pizza and enjoyed the crisp air and peoplewatching the smiling faces of Crested Butte. Brenda and Judy had done the Lupine trail with a much later start, so they got back around 1:30, showered at the hostel, and then we were off just as the afternoon rainstorm hit.